September 18, 2014 / Modified sep 18, 2014 5:12 p.m. The remnants of what earlier in the week was Hurricane Odile missed Tucson Wednesday night and early Thursday, leaving residents and emergency preparedness officials ready, but with little to respond to. Heavy rain fell and washes flowed over their banks onto streets in Nogales Wednesday night, leading to street closures and some power outages. The American Red Cross reported that four or five Nogales families, totaling 15 to 20 people, were put up in a hotel Wednesday night because flooding kept them from their homes in a neighborhood known as "Pete's Kitchen." The National Weather Service's J.J. Brost said Tucson was one of the few dry spots in the region. We were essentially a hole surrounded by rain. We really didn’t get a lot of rain in the city. Santa Cruz County and Cochise County, and even up into Graham and Greenlee counties received 3 to 4 inches of rain," he said. 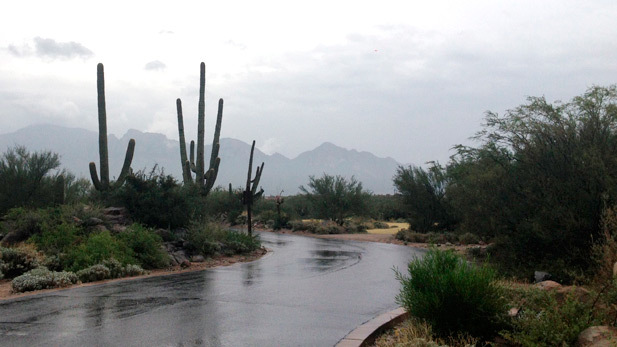 The National Weather Service reported rainfall of one-half inch to 2 inches in areas south of Tucson, and up to 4 inches in parts of Santa Cruz and Cochise counties. There were no reports of major flooding or casualties. Judy Hector with the city of Sierra Vista said the city received nearly 3 inches of rain in the storm. "Things are wet. We’re splashing through some puddles here and there, but we’re doing really good. The City designed the roadways and washes for heavier storms, so the water was carried away from structures and we didn’t have any structural damage," she said. Bisbee saw the largest rainfall in the region, with some areas topping 5 inches total. The Old Town neighborhood of Bisbee saw minor flooding, but all roads and public services remained open. Odile swept in from Mexico after it made landfall as a hurricane on Baja California'a Pacific coast. It crossed the peninsula west to east over the Sea of Cortez and came ashore again near Puerto Peñasco, Sonora, before turning to the northeast. By then, it had been downgraded to a tropical storm and then to a tropical depression. Still, it carried the potential for significant rainfall, and forecasters warned Southern Arizonans to prepare for severe weather. The storm's track called for it to continue moving to the northeast, including the Tucson area. But it veered more easterly. Recalling a Sept. 8 storm, also from the remains of a Pacific hurricane, city of Tucson and Pima County officials hastily called a news conference Tuesday and said they were activating emergency plans. In the Sept. 8 storm, a Tucson woman and a woman from Pinal County died in their vehicles after they were submerged in swollen washes. The Phoenix area was hit hard in that storm, with flooding in Mesa and widespread power outages and wind damage.